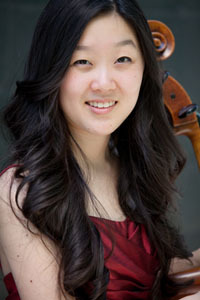 Ila Shon (cello) was 16 when she won the Khuner Concerto Competition. She began cello at the age of six and has studied with Sieun Lin in the San Francisco Conservatory of Music Pre-college Division. Ila was invited to perform in Carnegie Hall at age 13 and has been a student in the Perlman Music Program’s Summer Music School in New York and its winter residency in Florida since 2011, where she studied with Ron Leonard and Paul Katz. She has performed in master classes with Yo-Yo Ma, Laurence Lesser, David Finckel, Hans Jorgen Jensen, Paul Watkins and the Pacifica String Quartet, among others. Ila has won numerous music competitions. In 2016, she won the California Youth Symphony’s concerto competition. In 2015, she was awarded second prize in the cello division at the Johansen International Competition for Young String Players, in Washington. Previously, she won the Pacific Musical Society Centennial Competition, the Korea Times Young Artist Competition, Diablo Valley College Young Artist Competition, the Alexander & Buono International Strings Competition, and the American Protégé International Piano and Strings Competition. She was also featured on the NPR radio program “From the Top” in 2010 and 2014. In 2012, Ila was a soloist at Stanford University’s inaugural TEDx Conference and in 2013, she was invited to perform at the Lobby Conference, a premier gathering of thought leaders in digital media on Lanai, Hawaii.